de Cor's Handmades - Malaysia Handmade Jewelry: USD$24.50 for 3 Tutorials - Tutorial Value Pack by Erin! USD$24.50 for 3 Tutorials - Tutorial Value Pack by Erin! Especially for the holiday season when hopefully everyone will have a little more time on their hands! Pay LESS for bulk purchasing Erin's tutorials, USD$24.50 for all three! 3 wire work tutorials ranging in skill level from Novice/Intermediate - Advanced - Very Advanced. Learn how to make a pair of beautiful hoop earrings (1 inch diameter) with "Koru" swirls. No beads required, only 3 gauges of wire (20,22 and 28) plus tools. Delivery of PDF file via email as specified in your paypal account. Guarranteed delivery within 24 hours of payment received (usually much quicker!). *I now also include a free video tutorial link for making the Koru motif! 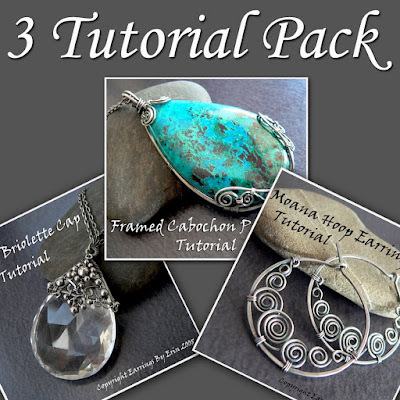 This tutorial teaches how to make a cabochon into a stunning wire wrapped pendant. The minimal, swirled frame allows the beauty of the gemstone to shine through. This tutorial is for making the pendant only, not the chain or clasp. Because your cabochon will probably be a different shape and size to the one used in the tutorial some measurements will need to be discovered by trial and error. If you’re not confident about figuring out your own measurements try to find a cab close to the size and shape of the one used here. Tutorial has 28 pages and 68 colour photos. This tutorial teaches how to make a beautiful wire ornate bead cap and bail for a very large briolette bead. Instructions are included for the pendant – not the chain or clasp. This tutorial requires small fiddly work and the ability to discover some measurements by trial and error as your briolette will likely be of different dimensions than the one shown here. If you’re not confident with this try to find a briolette close to the size of the one used in the tutorial. Measurements given are in cm/mm. Some basic math and measuring is required. The tutorial has 39 pages and 84 colour photos. You will need Acrobat reader to view all these files. If you need any help at all just let me know!